Panasonic is overhauling its line up of older lens models, revamping the cosmetic appearance, and, where applicable updating focusing and image stabilization systems. 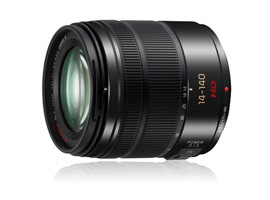 This new model replaces the Lumix G Vario HD 14-140mm f4.0-5.8 ASPH Mega OIS lens – a hugely popular model with filmmakers, on account of its 10x zoom ratio and constant 0.5m minimum focus distance. As the equivalent to a 28-280mm, the original model had a complex optical construction comprising of 17-elements in 13 groups and used four aspherical elements and two ED lenses to reduce the size while lowering chromatic aberrations to a minimum. This new offering not only replaces the original but also has to compete with a rival high performance model from Olympus. As a result it boasts the improve stabilization system over the first model and with 14 elements in 12 groups and variable minimum focus distance of 0.3-0.5m, it’s much smaller and lighter (265gvs. 460g) than original. While the construction is simpler overall, the new model retains two high-grade ED glass elements, and has three lenses with aspherical surfaces. This model is also compatible with the new high-speed 240 fps focusing system found on the GH3, G6 and GX7, and is available now at around $699. 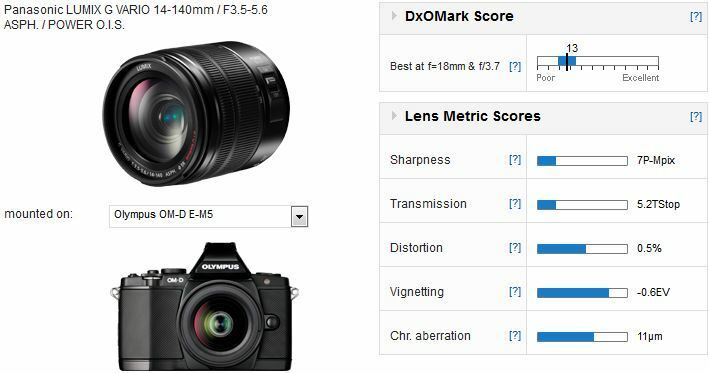 With a DxOMark lens score of 13 points on the E-M5, lens performs well and the score is a good result for a zoom with such a high magnification. Distortion, often an issue with designs like this, is well controlled. Chromatic aberration is also reasonably well held in check but it’s higher than you would see with the best in class and, as a result, it’s visible in the corners throughout the zoom the range. Sharpness levels are quite good for a lens like this, though inevitably this lens is sharper at the shorter end with sharpness falling off quite early on, from around 28mm onwards up to 140mm. While we’ve not yet analyzed the performance of the rival Olympus model, we can compare it to its predecessor. 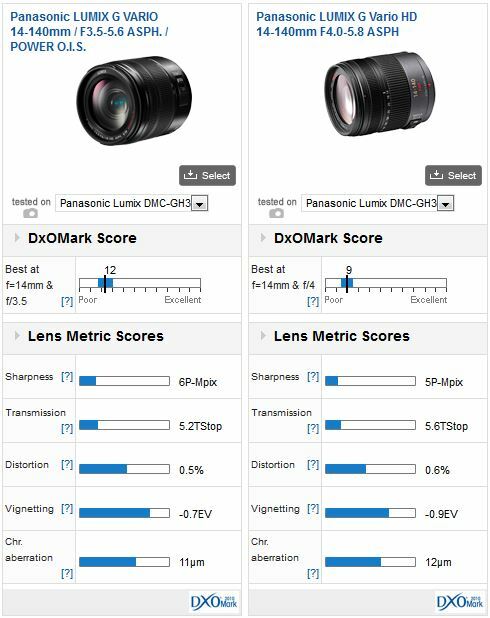 A three-point gain in the DxOMark score shows that in this case the less complex optical design results in improvement in image quality generally, and specifically with regard to sharpness and uniformity of sharpness across the field. Not only is the lens slightly brighter, particularly at the shorter focal lengths, which is borne out in the Transmission results, but improvements have been made with regard to shading throughout the zoom range. While we’re unable to comment on the effectiveness of the new stabilization and focusing systems, the Panasonic Lumix G Vario 14-140mm f3.5-5.6 ASPH Power OIS has many benefits over the original. Not only does it have a slightly faster maximum variable aperture, but Panasonic has achieved considerable weight and size savings over the original. Best of all though there has been no compromise on image quality, in fact the new model is a better performer optically. Add to that the new lower price of $699 and this new version shouldn’t be overlooked.